Home > Commercial-Land Mobile-Marine > HNN4595 : 7.5 volt 1800mAh long life rechargeable NiCd battery for Motorola SABER radios, etc. 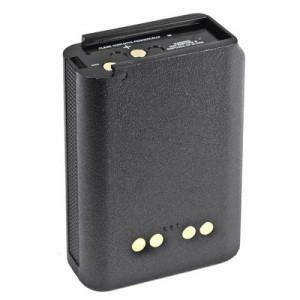 HNN4595 : 7.5 volt 1800mAh long life rechargeable NiCd battery for Motorola SABER radios, etc. The HNN4595 is a 7.5 volt 1800mAh long-life rechargeable Ni-Cad battery for Motorola SABER, ASTRO SABER, MX1000, etc. Battery height is 4". Replaces original battery #s NTN4594, NTN4595, NTN4595A, etc. Re-charges with desktop Fast or Slow chargers.